We scoop the ice cream and you make the sundaes! Please refer to our flavors page to check particular allergens should you be concerned. We are a “ServeSafe” facility but do use nuts in our factory. Indicate quantity for each flavor. Minimum order is 20 bowls. 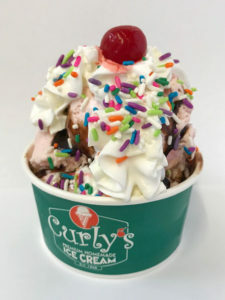 Get our promotions and deals and Free Ice Cream on your birthday.